The gathering to honor Michigan's top-ranked high school felt almost as much like a family reunion as a celebration. On Feb. 7, hundreds of Michigan Mathematics and Science Academy students, teachers and parents assembled to hear a musical performance and watch the Mackinac Center present a special plaque. The high school at MMSA, a public charter school authorized by Grand Valley State University, earned the top spot on the latest edition of our Context and Performance Report Card. The CAP Report Card gives its highest recognition to schools that overcome obstacles associated with poverty. It takes that approach because there is a strong statistical relationship between higher poverty and lower achievement. 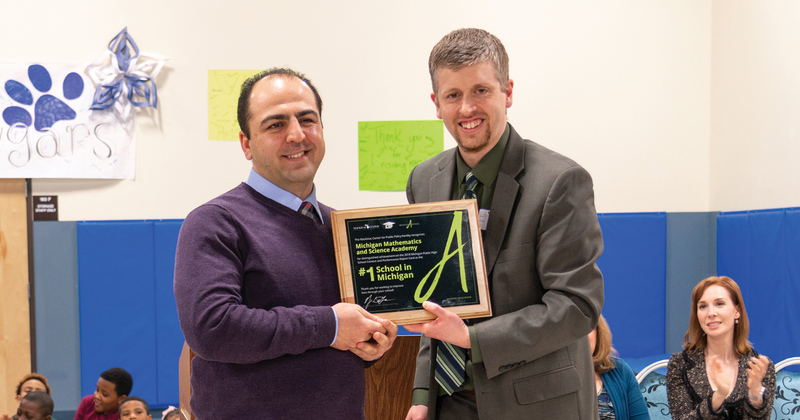 "Mackinac Center's CAP Report Card has not only honored our school as the best in the state of Michigan but also motivated us to continue providing the best education possible for our students," MMSA superintendent Oguzhan Yildiz said. Public charter schools made up less than 12 percent of the schools on our high school report card but earned eight of the top 17 scores. For the first time in four editions, Star International Academy in Dearborn Heights walked away with second place rather than first. Not because Star International lost ground, but because an upstart fellow charter did even better. CAP Scores are assigned based on how well a school does compared to the expected result, given the share of its students in poverty. A score of 100 indicates that expectations have been met, but MMSA scored 143.32, breaking the old record. In doing so, MMSA became the most prominent example of how a class full of students in poverty can exceed expectations. Michigan Mathematics and Science Academy is part of the Concept Schools network, a nonprofit charter management company based in Chicago, with schools across the Midwest and Great Lakes region. MMSA's success is a testament to the caring, trusting relationships between staff and students, built on hard work and sacrifice. That trust is crucial to help students put their best efforts into tests that provide state officials with a key measurement of the school's quality. Many teachers have given up weekend and holiday time to invest in students outside the traditional school day, providing extra academic help, and more. During this school year alone, staff members have visited 60 percent of their students at home to build a personal connection and see firsthand the challenges they bring to school. Reflecting the school's strong sense of community, the celebration attracted recent graduates Justin Wilton, a freshman at the University of Michigan, and Jamya Horton, who joined the Army National Guard. Both testified of caring teachers and the value of participating in the Concept Youth Scholars Program, which motivates students toward community volunteering, personal enrichment and extended field trip explorations. More than 93 percent of MMSA's low-income students attend class on a typical day, including some students who take as many as three different mass transit buses to get to school. "There is something good that we are doing here," said Yildiz. The school’s success is rooted in a family environment where staff members push students to reach their potential, and students are motivated to respond. “They need an adult who cares about them — not only in words, but in actions,” Duman said.